The Alaska Wildlife Conservation Center was a treat for the whole family during our Anchorage trip, and for a photographer, it’s a pretty sweet alternative to a zoo. While there’s no question that it lacks that extra ingredient that comes from meeting a wild animal in its own world, the usual disappointment associated with photographing captive animals is offset by some of the stories about how/why the animals came to be at the center. 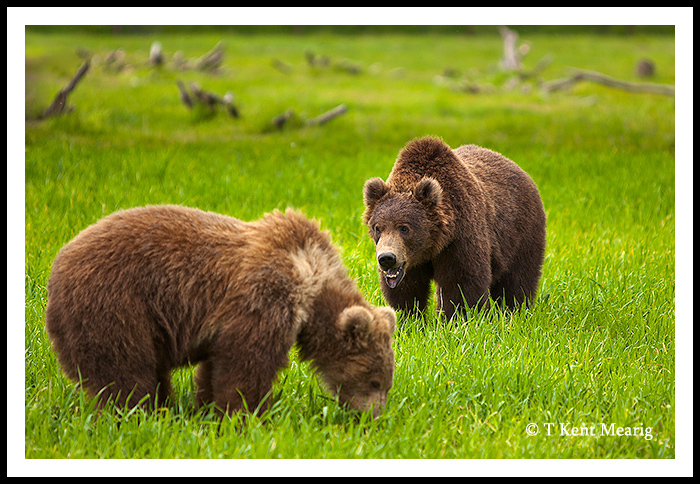 These two orphaned Kodiak brown bears would normally have been left for nature to take its course (the Kodiak bear population is healthy). Instead they are being prepared for transfer to a brand new exhibit in Sweden designed especially for them. I employed extensive cropping and some cloning to hide the distracting metal-shielded tree trunks of the enclosure.